The letters of Alessandra Strozzi provide a vivid and spirited portrayal of life in fifteenth-century Florence. Among the richest autobiographical materials to survive from the Italian Renaissance, the letters reveal a woman who fought stubbornly to preserve her family's property and position in adverse circumstances, and who was an acute observer of Medicean society. Her letters speak of political and social status, of the concept of honor, and of the harshness of life, including the plague and the loss of children. They are also a guide to Alessandra's inner life over a period of twenty-three years, revealing the pain and sorrow, and, more rarely, the joy and triumph, with which she responded to the events unfolding around her. 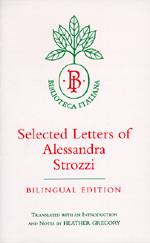 This edition includes translations, in full or in part, of 35 of the 73 extant letters. The selections carry forward the story of Alessandra's life and illustrate the range of attitudes, concerns, and activities which were characteristic of their author. Heather Gregory is Assistant Registrar in the National Office of Overseas Skills Recognition, Australian Commonwealth Government Department of Employment, Education, and Training in Canberra.